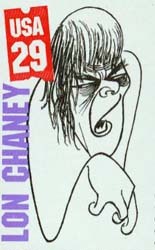 While several American Presidents have only a single postage stamp commemorating them, Lon Chaney has two different stamps. This 29¢ stamp, released in 1991, was one of a series of 10 stamps commemorating "Stars of the Silent Screen." In addition to Chaney, Rudolph Valentino, Clara Bow, Charlie Chaplin, John Gilbert, Zasu Pitts, Harold Lloyd, Theda Bara, Buster Keaton, and the Keystone Cops had their own stamps. The series of stamps was drawn by New York cartoonist Al Hirschfeld who, coincidentally, is married to film star Dolly Haas. 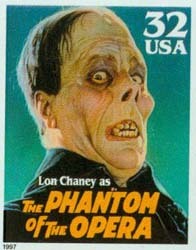 This 32¢ stamp, released just before Halloween in 1997, featured "Classic Movie Monsters" with Chaney as the Phantom of the Opera, Boris Karloff in two stamps as Frankenstein's monster and The Mummy, Bela Lugosi as Dracula, and Lon Chaney, Jr. as The Wolfman.